My first movie goofs post back in January covered Disney's Aladdin, penned and directed by Disney titans John Musker and Ron Clements. 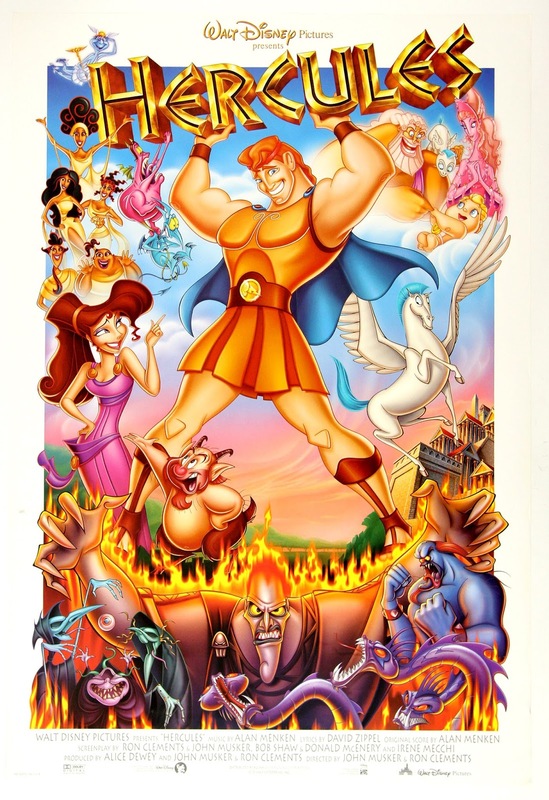 They've made some of the most treasured Disney hits to date: The Great Mouse Detective, The Little Mermaid, The Princess and the Frog, and, as you've worked out now, Hercules, released in 1997. When Pain and Panic kidnap Hercules as a baby, they turn into large snakes after failing to give him the entire potion that removes his godlike status. Their attempt to kill Hercules fails and he effortlessly throws them sky high without taking a single scratch. So how did their comical dragon forms manage to kidnap Hercules in the first place? Considering this is when he was a friggin God! Had he flailed, any hand or foot to the face would've sent Pain and Panic to the other side of the universe. Zeus and Hera know Hercules is on Earth, turned mortal and unable to return to Olympus. They watch over him as he grows up and are fully aware of his existence. Zeus had no idea Hades was behind this plan, and it seems after eighteen years, Zeus either never mentioned his sons absence or Hades never received an invitation to a possible public mourning Zeus could've initiated. How out of touch with reality could Hades have been to find out about Hercules being alive after nearly two decades when everyone else on Olympus knew the entire time? The Fates seem to have some sort of magical death string that kills anyone as soon as it is cut. If Hercules is mortal, surely they can use it to kill him? Does his strength have any relevance? It won't protect him from instantaneous death, surely? Hades could've briefly consulted them to grab some scissors, cut a thread, and boom, job done. To add to this, if Hades watches as the souls of the dead fly into his lair and into the River Styx, could he not have checked to see if Hercules came in when Pain and Panic claimed to have killed him? A quick check surely would've taken a few minutes, and he had a good eighteen years to do it. Zeus tells Hercules to seek out Phil, the trainer of heroes, in order to begin his quest to become a God again. Hercules then mounts Pegasus and flies into the night sky, finishing his epic musical crescendo. However, Zeus never told Hercules what Phil looks like, where he resides, or anything else other than his name and occupation. Despite this, Hercules still managed to find him with ease. How did that happen? Where did Hades' deal to make Hercules sacrifice his strength come from? Like, his magical powers are simply devised there and then because the script says so. Why couldn't he just make Hercules sacrifice his strength permanently? Or remove his strength without some sort of deal? It's never clearly explained just how complex his powers are, and they seem to just change on the spot whenever the script needs them to. This whole scene seems to happen because plot. When he drains Hercules of his strength, Hades throws a huge dumbbell weight at him, knocking Hercules to the floor in agony, but bypasses the chance of turning Hercules into a splattered red mess with that same dumbbell. It's villains like this that have no right to complain when they face their eventual downfall. Despite being drained of his superhuman strength, Hercules is brutally kicked, thrown, and smashed into walls by the monstrous Cyclops beast and suffers no injuries whatsoever. Seems like Hades' magic did nothing after all. After a tiny bit of encouragement, Hercules can kill the Cyclops by merely wrapping some thin ropes around its legs and sending it falling off a cliff which, if you catch a glimpse of the buildings below, isn't even that high. For such a powerful, legendary beast, the Cyclops seemed to die quite easily. When Meg dies, Hercules makes his way into the Underworld and confronts Hades. Hercules is mortal. He is strong, yes, but not a god or a supernatural being. So how is it he can't go to Olympus but he can go to the Underworld? How did he even get there? He didn't ever go there before and was never given any sort of direction as to where it was in any previous scene. Did he just keep digging in a random spot until he got down far enough? A commonly known visual error - Hercules sees Meg's soul in the River Styx and reaches in to grab it, though his hands quickly seem to rot when submerged. When he later jumps into the river to save Meg, he has to dive well over twenty feet to even reach the surface. Oops. Referring back to that scene, why did Hercules' hands turn all wrinkly and grey seconds after he put his hands into the river to grab Meg, yet when he swims through the river completely, his body takes much longer to get to the same state. Yet another reason why Hades and his entire magic/lair is quite possibly the worst in Disney history. I get that Hercules' celebrity status can't make him a "true hero". But had the Gods of Olympus slightly revised their awkward logic, the climax of the film could've been a lot less problematic. Hercules gives up his strength to save Meg, defeats the Cyclops without it, does everything he can to prevent Meg's eventual death, and, of course, frees the other inhabitants of Olympus to lead the fight against Hades. After all that, his godlike status still does not return to him. It's only after he saves Meg in the River Styx that it does. This is when all the trouble is over and there is nothing left for him to fight. Had they just looked past their own ego, and in fact acknowledged that Hercules saving the townspeople countless times without biased emotional reasons was actually fairly heroic, a lot of Hades' plans could've been avoided before they even began. John Musker and Ron Clements make some great Disney movies, but man, do they love their plot holes. I wonder how illogical some parts of Moana will be?